The faithful of Paris sung hymns as France’s Notre Dame Cathedral was engulfed in flames. Media outlets have shared footage of crowds gathered in prayer and song, standing in vigil as the roof and spire collapsed amidst flames of Our Lady of Paris, while fire began to overtake the rest of the famous Gothic twelfth-century cathedral. A member of staff from Radio Notre Dame, the Catholic radio station of the Ile de France, recorded footage of a Parisian couple singing the “I Salute You, Mary,” with other passers-by near the Pont Saint-Michel joining in. The small group was joined by around 100 others. And as the night progressed, the crowd grew. 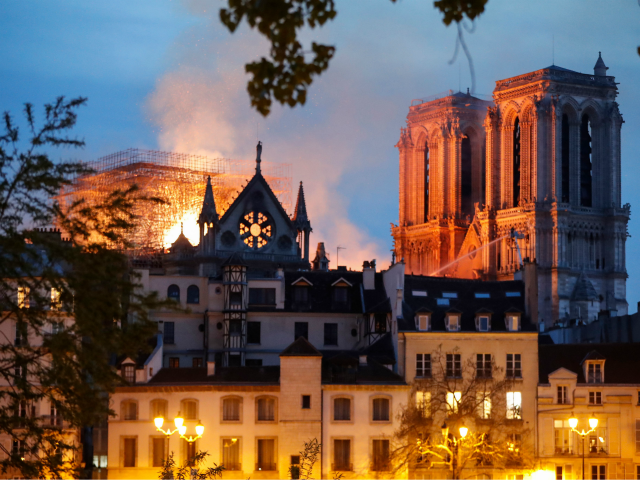 The fire has since spread to the building’s iconic bell towers, with the Paris fire brigade having reportedly said they may not be able to save the cathedral at all. #NotreDame de #Paris priez pour la France en ce jour de deuil national! You can read Breitbart London’s coverage in full of the tragic fire here.